In direct response to cyber threats, the UK HM Government began working to develop the Cyber Essentials Scheme, technical controls to be used by organisations to mitigate the risks associated with common Internet-based threats. Cyber crime continues to pose a valid and growing threat for every business, large or small in London, Hertfordshire and across the UK. As a result of these on-going and continuous threats, the HM Government worked with IASME (the Information Assurance for Small and Medium Enterprises consortium) and the ISF (the Information Security Forum) to develop the Cyber Essentials scheme, a technical and foundation-level security framework that organisations could adopt and meet to reduce the risks of cyber attacks. Since the GDPR (General Data Protection Regulation) replaced the Data Protection Act on 25th May 2018, if your business faces a cyber attack where your company and client data becomes compromised, should you not have put in place significant operational and IT measures to protect and report data loss, under the GDPR , the ICO (Information Commissioner’s Office) can impose fines of up to 20 million Euros or 4% of group worldwide turnover (whichever is greater) against both data controllers (your business and its owners) and data processors (your employees). 2 out of the 12 steps for GDPR compliance include Data Privacy and Data Protection by Design DPIA and this is how Cyber Essentials relates and works to meet these very important GDPR compliant areas. In essence a fundamental and key part of GDPR surrounds Cyber Security to protect against Data Breaches and Data Protection and becoming Cyber Essentials Certified works to meet these two crucial GDPR areas. Therefore, ensuring that your business computer systems and software platforms are cyber secure and that you as a business are Cyber Essentials Certified is essential to becoming GDPR compliant. 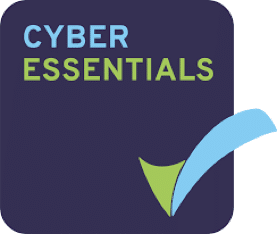 Cyber Essentials will invaluably help bring UK businesses inline with the cyber security compliance requirements to meet the GDPR requirements, as well as strengthen the security of their business IT systems, their overall cyber security and business continuity policies. As part of our Managed IT Security to London and Hertfordshire businesses, using multiple cyber security protection platforms, technical security changes, vulnerability scanning and qualified systems auditing, we identify and tighten external and internal security weaknesses and validate your business’ IT cyber compliance against the Cyber Essentials Scheme regulatory standards in line with the GDPR (General Data Protection Regulations), GCHQ (Government Communications Headquarters) and ICO (Information Commissioner’s Office) requirements and guidelines. We’re proud to become Cyber Essentials Certified for our own Cyber Security and GDPR compliance. We achieved this for our own business to demonstrate how seriously we take Cyber and IT Security and to be able to do the same for our clients in London and Hertfordshire. Our Managed CE Compliance performs a full Cyber Security Audit across your business network and devices using a GCHQ Cyber Accelerated platform. Our gap analysis audit will show your current cyber security status and the improvements that need to be made in-line with the Cyber Essentials Scheme requirements. Once these technical changes have been made and we are satisfied that you will meet all of the Cyber Essentials Scheme criteria, we will submit the Cyber Essentials self-assessment directly to the IASME Accreditation Body on your behalf, who will certify you for the Cyber Essentials Scheme as well as arrange for £25,000 Cyber Liability Insurance Cover to be put in place. We will moving forward proactively manage your Cyber Essentials compliance and bring all future discovered network devices inline and compliant. Our managed platform provides you with email notifications, reports and scan results showing your on-going cyber security status and continous Cyber Essentials Scheme compliance, as well as useful training and GDPR information. The Cyber Essentials self-assessment will be re-submitted to IASME annually through our platform, automatically taking into account any and all business IT security changes so that you are re-certified and to ensure your Cyber Liability Insurance remains valid. Personally speak to one of our Directors about your Cyber Essentials and GDPR Compliance. Complete this quick form and we will be in touch. We are an award winning Microsoft Silver accredited and HM Government Cyber Essentials certified IT Services Company delivering Managed IT Support, IT Security, Business Continuity, Cloud Solutions and IT Consultancy through our customer service driven ethos The Amazing Way®. We are also an official partner and member of the HM Government agency UK Trade & Investment’s (UKTI) UK Advisory Network (UKAN) where we have key experience enabling non-UK businesses to expand or extend their overseas operations into the UK market.